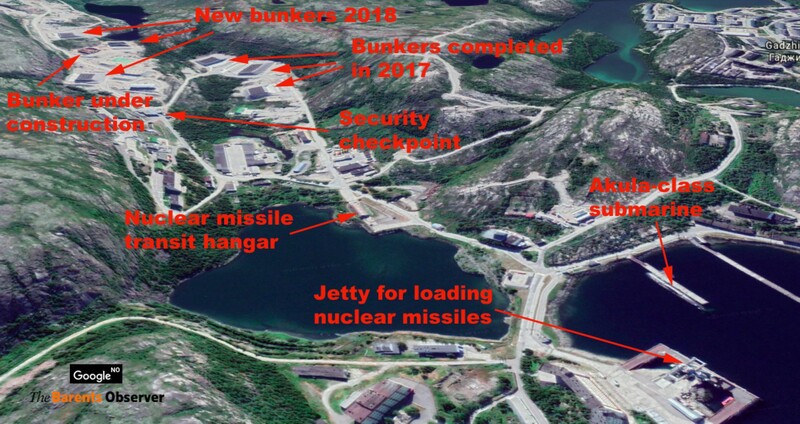 The major expansion of storage facilities for both nuclear missiles and conventional long-range high-precision cruise missiles will significantly boost Russia’s military power and strengthen the bastion defence capability in the Barents- and Norwegian Sea. By comparing one, two and four years old satellite photos with Google Earth images recently made public, Barents Observer’s study clearly shows the progress. Both in Okolnaya Bay and at Gadzhiyevo submarine base some 15 kilometers further west. Where only the initial roadwork could be seen four years ago, foundations came two-three years ago, while concrete walls and roof are now in place at most of the bunkers. You have to launch Google Earth to see the external sattelite pictures linked in this article. Links will open in new window. Last year, the Barents Observer published satellite images from Gadzhiyevo where construction took place. Viewing the same valley today, ten reinforced bunkers seems nearly completed. Gadzhiyevo is the home base for the Borei- and Delta-IV class ballistic missile submarines. Close to the new bunkers are the entrances to underground tunnels where the nuclear warheads either are stored today or, in case of increased tensions, could be supplied from the central storage some 20 kilometers north of the air base in Olenegorsk in case of increased tensions. There are five believed locations for storing nuclear warheads at the Kola Peninsula today; Gadzhiyevo, Okolnaya Bay, Shcukozero, Bolshoya Ramozero and Nerpicha. The last is only 65 kilometres from the border to Norway. In Okolnaya Bay, north of Severomorsk, about 40 bunkers are visible in the northern part of the territory. Also here is the progress seen when comparing images taken in the end of July this year with pictures from some few years back. Rocks are blasted at 10 other plots in the size similar to the bunkers already in place. With a total of 50 bunkers in Okolnaya and 10 in Gadzhievo, the Northern Fleet gets new weapons storages of about 60,000 square meters. Okolnaya July 2018 (left) compared with 2015 when roads and plots work started. Google Earth and Microsoft Bing. The part of Okolnaya Bay naval munitions storage where construction work takes place is named Technical territory No. 4. That is, however, not the only part where new or expanded storage bunkers are built. Behind the hill, about a kilometre from the shore, four 80 meters long bunkers are erected. Each of the four bunkers is in size big enough to hold the 16 Bulava missiles each of the new Borei class submarines will carry. Three of the eight Borei submarines are already sailing, while the five others will be commissioned from the yard in Severodvinsk by 2021 according to the plans. Neither the Russian Navy, the Defense Ministry in Moscow, nor the Russian Embassy in Oslo have responded to requests for comments. 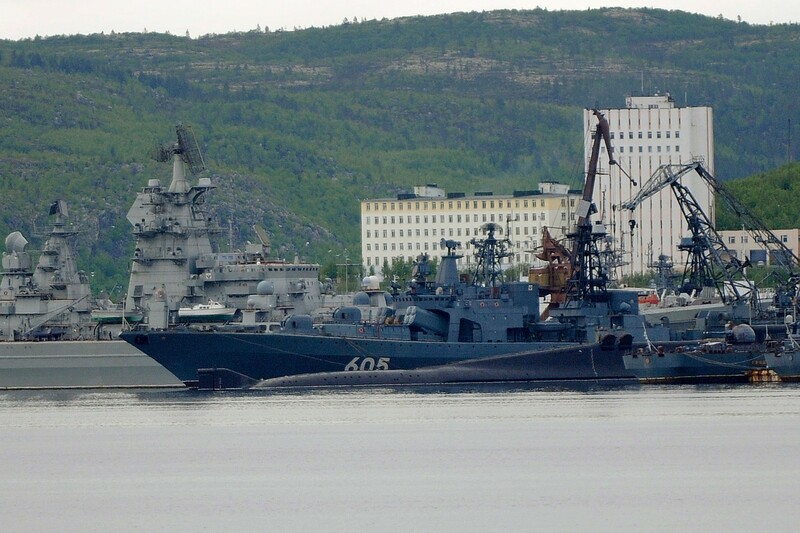 The Northern Fleet’s Press Service in Severomorsk has a policy of not answering foreign media. Naval Missile Storage with four new bunkers. The Bulava missile and its carrier, the Borei subs, is Russia’s most expensive weapons project ever. When fully deployed, the system will be the cornerstone of the country’s nuclear triad, making control over the Barents Sea bastion even more strategic important. Okolnaya Bay is from before the largest weapon storage site in Northern Russia and covers a land area of about ten square kilometres, including the harbour jetties where the weapons are loaded on board the submarines and surface warships. 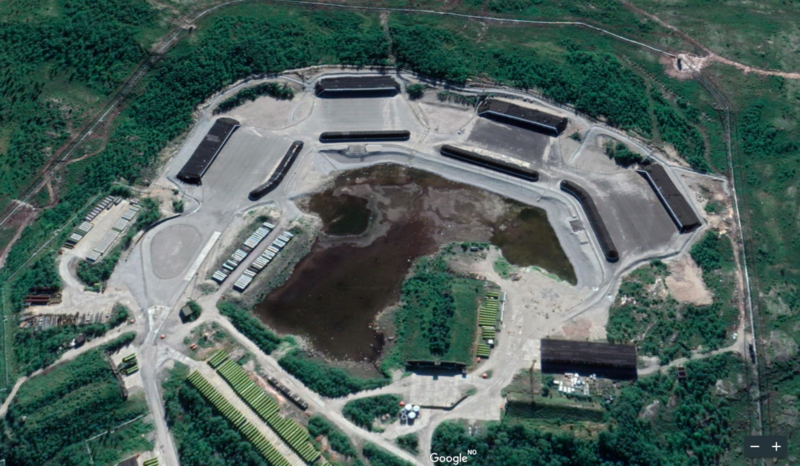 The date of the latest Google Earth images is easy to determine. Zooming in on the central harbour promenade in Severomorsk, across the bay from Okolnaya, hundreds of people are lined up watching the Russian Navy Day parade with vessels showing off their weapons in the waters outside. Navy day this year was July 29th. 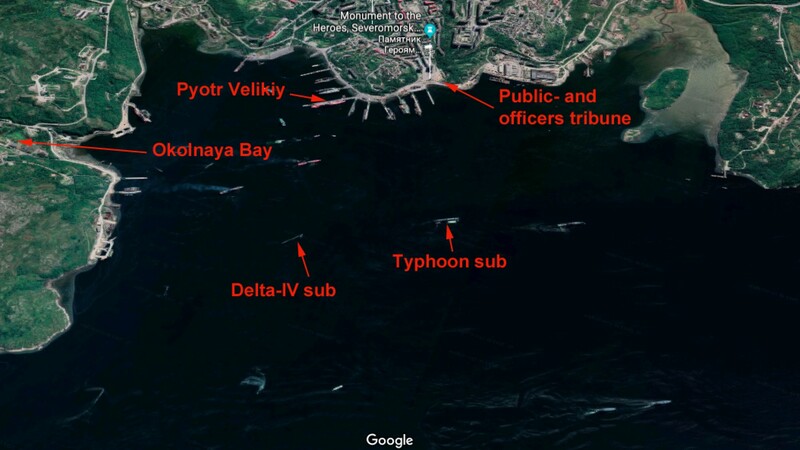 Satellite picture from Severomorsk Navy Day 2018. Russia’s only remaining Typhoon submarine, “Dmitry Donskoy” can be seen as well as a Delta-IV submarine. Both were shown in Rossiya 24’s news video from the Navy Day. In 2017, the Typhoon sub was in St. Petersburg at the time of the Navy Day. For Norway, being a NATO member with territories inside what Russia would define as its bastion, the rearmament of the Kola Peninsula is bad news for two reasons. Conflicts in other parts of the world could if escalating trigger the military command to establish an anti access, area denial zone including Norway’s coasts to the Barents- and Norwegian Seas. Secondly, Russia can with its new supersonic cruise missiles launch accurate attacks against navy ships in the Norwegian Sea or military installations on shore in the northern parts of Norway, Finland or Sweden directly from the Kola Peninsula or Russian part of the Barents Sea. Today, both frigates and submarines in the Northern Fleet carries such cruise missiles, like the new supersonic Kalibr with a range of 1,500 kilometres that during the Syrian war showed capability to struck targets with a high degree of precision. The missile is only one of the new modern weapons that will be supplied in large quantities and stored at new facilities near Severomorsk. Speaking at NUPI’s annual Russia conference in Oslo on Friday, Norway’s Foreign Minister Ine Eriksen Søreide said Russia’s military build-up combined with its demonstrated willingness to use that military force has created an uncertainty about the country’s intentions. 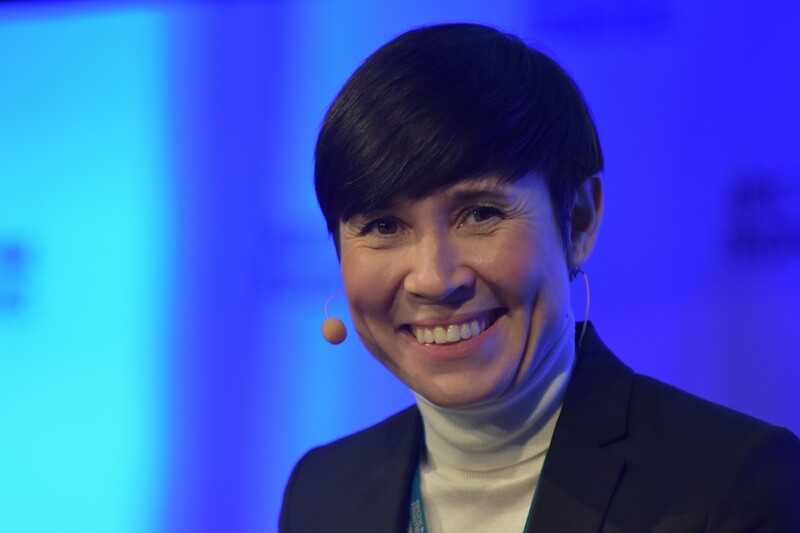 Norwegian Foreign Minister Ine Eriksen Søreide. The Foreign Minister said she is aware that the military activity is not primarily aimed at Norway, but underlined a concern regarding Russia’s build-up of forces, deployment of new weapons systems and a more assertive posture that appears in the immediate neighbourhood in the north. “We can’t ignore what takes place so close to our territory,” Eriksen Søreide said and pointed to last year when Russian fighter jets during an exercise simulated attacks on Norwegian targets. “This do not contribute to better relations and it doesn’t lower tensions,” the Foreign Minister says. We can’t ignore what takes place so close to our territory. Professor with the Norwegian Defense University, Katarzyna Zysk, was also present at NUPI’s Russia conference. She says to the Barents Observer that Russia has demonstrated possible scenarios involving bastion defense on several occasions during large-scale exercises. “In case of simulated conflict with NATO, Russia was rolling out the bastion defence to establish several layers of defences involving various capabilities to ensure the survival and freedom of action for the strategic ballistic missile submarines, and to prevent access for enemy naval forces to areas in the immediate neighbourhood to the naval bases on the Kola Peninsula,” Zysk tells. She says additional to the importance of Russia’s nuclear weapons deterrence, conventional capabilities with modernized weapons play an increasing role in supporting deterrence, defence and coercion. “Russian authorities promise to provide a full non-nuclear deterrence by expanding the number of non-nuclear strategic weapons four-fold by 2021,” Katarzyna Zysk says. On board Northern Fleet vessels, cruise missiles like the Kalibr and the Kh-101 have given the fleet much better precision strike capability and longer range than anytime before. Also, Russia has proven that the Northern Fleet will play an important role in the country’s goal to be global military power operating far away from its home bases. Over the last few years, Northern Fleet ships have sailed around the world and been active in warfare against targets in Syria from positions in the eastern Mediterranean. Senior research fellow Njord Wegge with the Norwegian Institute of International Affairs (NUPI) is an expert on security and defense relations in the Arctic. He says the security dynamics in the north is directly related to what happens globally and East-West relationship more generally. “After Russia’s annexation of Crimea in 2014, the more constrained East-West relationship has spread to the north,” Njord Wegge explains. Few commentators think it is likely that a conflict will start in the High North. “Also within the coast guards as well as military headquarters in Northern Norway and Russia there are regularly contacts, something that lower the risk of misunderstandings,” Njord Wegge tells. Though, the Kola Peninsula, as can be seen on the new satellite pictures, is more and more important for Russia’s military. “As the Barents Sea is a key patrol area of the Russian strategic submarines it is also important to have surface vessels present to improve the combined military capabilities in this important military theatre for Russia,” Njord Wegge says. The senior researchers agrees that Russia nowadays is commonly regarded as a state with clear great power ambitions. “For great powers, naval power capabilities, such as large surface warships, both play a symbolic role, as well as they represent an instrument for power projection, often associated with great power status. Finally, a modern fleet is also of crucial importance for purely defensive purposes for Russia, not the least related to the role of protecting their strategic submarines,” Wegge explains.